D2Z ENCAPSULATOR SKINSUIT SST BLACK SIZE MEDIUM. The fastest skinsuit in the world, as used by Alex Dowsett to set world hour record, as used by Movistar world tour team, as used by a large percentage of the UKs top testers! My loss can be your gain! 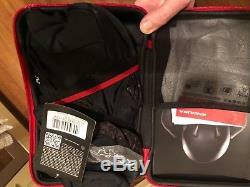 Brand new in box with tags size medium. The flagship piece of Enduras Aero collection, the Encapsulator Suit represents the pinnacle of aerodynamic cycle-wear for the rider who is obsessed with speed. Using Drag2Zeros (D2Z) cutting edge technology the skin suit has been proven on multiple UCI WorldTour races, delivering podium finishes for our Pro Teams, Movistar and Cervélo Bigla. On the track the suit has helped both Alex Dowsett and Bridie ODonnell break the UCI Hour Records and leave their mark in cycling history. Over 80 different skin suits have been created, tested and remastered to reach the point where we are finally content to release it to the wider market. Optimised for speeds over 45kph and in a TT position, the Encapsulator Suit is the go-to piece for any time trial rider looking to reach a new level. OPTIMISED FOR TIME TRIAL BIKE SPEED RANGE 46-58KPH (28-36MPH). While most brands test at one single speed, Endura Drag2Zero® understands the critical variations in aerodynamic efficiency at different speeds and in different riding positions. As an example, a suit optimised for a TT rider, averaging 50kph in an aggressive aero position is not necessarily the fastest suit for a rider on a road bike, chasing a sportive PB averaging 35kph. Developing the Endura D2Z® range around this broader philosophy has resulted in products which are finely tuned to the requirements of the target rider, not only faster at one selected data point but across a range of speeds. 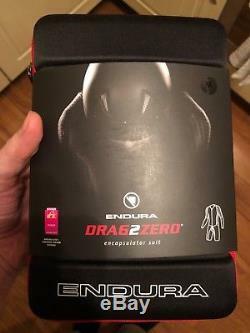 This exclusive, patent pending technology has been developed by Endura in close collaboration with Simon Smart of Drag2Zero® and validated by the worlds top road riders on the UCI WorldTour. SST is the result of years of R & D, studying airflow in wind tunnel alongside the development of new production methods to bring theoretical ideas to real world riding. Strategically positioned 3D chevrons positively affect airflow around the body, reducing drag at the speeds relevant to the target rider. Initially banned, then accepted, by the UCI the Encapsulator pocket has had a short, but controversial life. The super fine, translucent mesh allows race numbers to be clearly visible while retaining the breathability of the pocket area around the number. Providing a simple solution to the challenge of neatly attaching a race number, the Encapsulator pocket also protects the delicate fabrics from the damage caused by pins. 1000 SERIES (AERO) SEAT PAD. The 1000 series Italian stretch pad features is sculpted from a single block of foam so, unlike traditional layered pads, there are no clunky steps in pad thickness. The BioCeramic® high stretch, fast wicking face fabric incorporates a permanent antibacterial finish, completing one of the most advanced pads in existence. The Aero version of the pad, used in the D2Z® Encapsulator Suit is specially shaped to suit a more aggressive riding position. Enduras vast experience of garment construction and rigorous pursuit of faster fabrics comes together in the D2Z® apparel collection. The D2Z® Encapsulator Suit deploys 5 different fabrics in combination to meet the demands of fit, comfort, durability and aerodynamic efficiency. 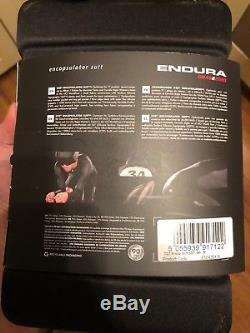 The item "ENDURA D2Z ENCAPSULATOR SST TT SKINSUIT BRAND NEW IN BOX WITH TAGS SIZE MEDIUM" is in sale since Monday, October 29, 2018. This item is in the category "Sporting Goods\Cycling\Cycling Clothing\Jerseys". The seller is "david3486" and is located in Twickenham. This item can be shipped to United Kingdom, Austria, Belgium, Bulgaria, Croatia, Cyprus, Czech republic, Denmark, Estonia, Finland, France, Germany, Greece, Hungary, Ireland, Italy, Latvia, Lithuania, Luxembourg, Malta, Netherlands, Poland, Portugal, Romania, Slovakia, Slovenia, Spain, Sweden, Australia, United States, Canada, Brazil, Japan, New Zealand, China, Israel, Hong Kong, Norway, Malaysia, Singapore, South Korea, Switzerland, Taiwan, Thailand, Saudi arabia, South africa, United arab emirates, Ukraine, Chile.